I booked a Christmas party. Hosted by us. At the farm. Well, I’m a bit anxious. Because, you see, the party is set for exactly one month before Christmas Eve. One month from today. And my dining room currently looks like this. Keeping it real, folks. The drawer for the china cabinet was damaged in the move and won’t slide into place until we fix it. 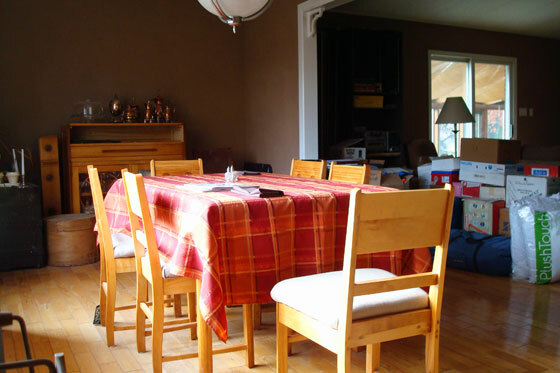 The extra furniture tucked in the left corner, the boxes stacked on the right and ironing board that is just outside of the picture will all go into the basement…whenever we finish the reno. My living room looks like this. 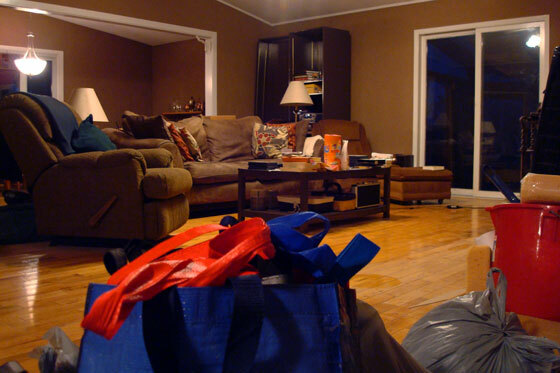 The couch is in the right spot, but the grocery bags and cleaning supplies in the foreground of the photograph are not. Oh, and my kitchen looks like this. Our “island” is a metal patio table over which I have thrown a plastic dollar store tablecloth. All of my small appliances and boxes of cookbooks are tucked underneath, as I have no other place for them yet. On the bright side, we have a spot for our stash of Hallowe’en candy. You may now realize why I haven’t shown a lot of pictures of the inside of the house. For the past seven months since we moved to the farm, we’ve been living in an increasing level of chaos. And it seems to be getting worse. Books, boardgames, extra furniture, sports equipment and all of the other items that will someday be in the basement are still packed in boxes and stacked behind the couch between the dining room and the living room. As we buy new things or have to access our packed items, everything gets a little more disorganized (see exhibit A above). You can see the tracks of our footprints in the drywall dust on the living room floor (see exhibit B above). I emptied the front hall closet, so that I could fit it out with shelves and rods and racks to actually store things in a somewhat more orderly fashion. That means our ancient vacuum cleaner, shopping bags, hats and gloves are all piled in the corner of the living room (see exhibit C above). The good news is that we are heading into the home stretch on our basement reno. The better news is that after exhibits A, B and C were photographed, a couple of tents, an air mattress, a camp stove and assorted Christmas decorations made their way downstairs. 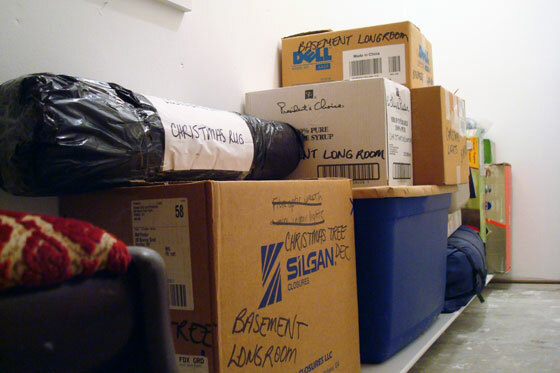 No need for colour, carpet or trim in the closet under the basement stairs. Two coats of prime do the job just fine. Some proper shelves would be nice though. I’m hoping that by party time carpet will be the floors in the rest of the basement. We may not have baseboards or much furniture by then, but if we can at least put some more things downstairs, I’ll feel a little better about our living environment. I like hosting parties, and I don’t worry too much about my house being perfect. However, I do have some standards. A basic level of organization and tidiness is required. The current state is not even close. Here’s hoping a hard deadline makes things move a little faster. Oh, and to Matt’s family… we’re really looking forward to hosting you next month! Really. Anyone out there have any tips on how to get organized? 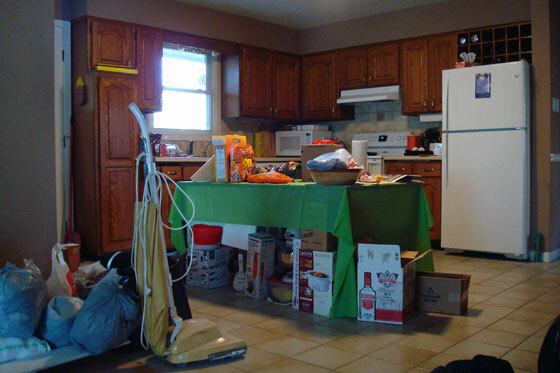 Please tell me someone else has tiles stacked in the living room, an ironing board in the dining room, dust tracks on the floors, a makeshift kitchen island and tools sitting on pretty much every available surface? Or perhaps you’re already looking ahead to Christmas. Who’s also in party planning mode already? What makes a good party at your house? Hosting a party is enough to make anyone nervous. Honestly though, don’t worry about the state of unpacking. One of the great things about family is that they overlook the most amazing of messes for the sake of being together. Thanks for the tip, Julie. I actually am really excited to show the farm to extended family for the first time. Sometimes we invite people over just so that I am forced to clean my house. I guess that doesnt help you any, does it? Good luck! I have been there! We moved from a six-bedroom house with a suite into a two-bedroom suite, and I couldn’t deal with any of the downsizing before the move. So our home looked like the storage unit of an auction house, and for a long time… I finally decided to have my students’ year end recital at the house (I teach piano), and threw myself into the process. It was protracted and grueling, and it’s still going on, but each time I host something else it gets easier and easier. You’ll get there too! So a party is actually a solution?